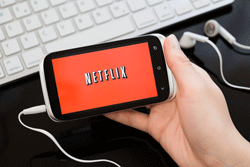 Netflix Inc. (Nasdaq: NFLX) held its annual shareholder meeting Tuesday and shareholders voted to approve the Netflix stock split. The stock split will bring Netflix's share total to 5 billion. That's more than 30 times the current number of shares on the market. This would be the second Netflix stock split, following a two-for-one split in 2004. Netflix stock climbed 3% Tuesday ahead of the meeting. That pushed the Netflix stock price to a new high of $648.16. According to FinViz, NFLX has the 8th most expensive share price on American exchanges. Company sources told CNBC we could see a five-to-one or 10-to-one split. That would bring share prices down between roughly $65 and $130. "At a lower price point, there's a perception the stock is more accessible," Netflix spokeswoman Anne-Marie Squeo told Bloomberg in April. But lowering the Netflix stock price isn't the only reason for a split. In a filing from April, Netflix officials said issuing new stock would allow better flexibility for dividends, equity financing, and acquisitions. Netflix would also have a comparable share total to other major tech firms. Apple Inc. (Nasdaq: AAPL) has 5.8 billion shares outstanding, while Microsoft Corp. (Nasdaq: MSFT) has 8.1 billion, and Facebook Inc. (Nasdaq: FB) has 2.3 billion. Netflix is now worth an incredible $38 billion. That's more than CBS Corp. (NYSE: CBS), Viacom Inc. (Nasdaq: VIAB) and even Sony Corp. (NYSE: SNE). Netflix shares have soared in 2015, gaining more than 89% in just over five months. Thank you for all your helpful information.